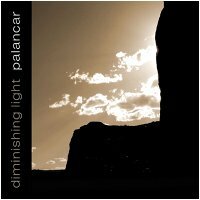 Today we have another Palancar re-release by Darrell Burgan to offer our listeners, an album originally released commercially in 2006 called Diminishing Light. This is a collection of diverse ambient pieces, sometimes reflective and thoughtful, other times gloomy and intense, but always moody and simmering with a barely-restrained energy. Unlike Darrell's more recent work in the digital realm, this album was made with a heavy emphasis on outboard synthesis, particularly analog synthesizers, and was mastered to magnetic tape. Some of the music in this album is quite abstract and dark, whereas other pieces shimmer with arpeggiated and sequenced electronics, while still others fall somewhere in the realm of textural sound design. Hopefully there is something here for everyone to enjoy. Darrell hopes that folks enjoy Diminishing Light and find the music in it to be fulfilling. Listening and downloading. So far, I'm blown away with this album. Happy New Year to you! Hope it's a good one! It's realy awesome! Fantastic atmosphere! Awesome, I was hoping this one would get released on here. I've had part of the CD from mp3 downloads on your old site and liked those, so I'll be interested to hear the rest. Diminishing Light is one downright creepy and very distinctive track.